Air Force Brig. Gen. Kevin Kennedy has been named deputy chief information officer of command, communications and computers and information infrastructure capabilities for the Office of the Secretary of Defense. 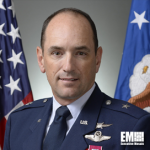 The Defense Department said Wednesday Kennedy currently serves as director of cyberspace operations and warfighting integration at the office of information dominance and CIO within the Office of the Secretary of the Air Force. Kennedy leads the integration of the U.S. Air Force‘s air, space and cyberspace information dominance functions into the joint fight under his current role. He previously served as commander of the 28th Bomb Wing at Ellsworth Air Force Base where he oversaw 27 aircraft and more than 4,300 military and civilian personnel. Kennedy also held the roles of Air Force Weapons School instructor, 28th Bomb Wing chief of safety, 34th Bomb Squadron commander and 28th Operations Group deputy commander. He logged 3,400 flying hours aboard the B-1 bomber and T-38 trainer aircraft as a command pilot.